USES: This medication is used to treat brittle bone disease (osteoporosis) in women who are at least 5 years past "the change of life" (menopause). 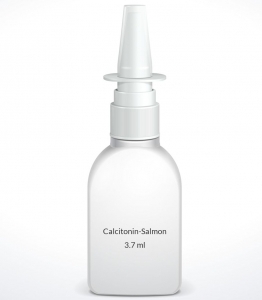 Calcitonin works by slowing bone loss to help maintain strong bones and reduce your risk of fractures. HOW TO USE: Read the patient and product information sheets if available from your pharmacist before you start using calcitonin and each time you get a refill. If you have any questions regarding the information, consult your doctor or pharmacist. This medication is for use in the nose as directed, usually one spray in one nostril each day, alternating nostrils daily. Remove a new bottle from the refrigerator and allow it to reach room temperature. Follow the instructions on how to prime the pump the first time you use a new bottle. Once the pump is primed, it does not have to be reprimed if the bottle is properly stored in an upright position. Consult your pharmacist if you have any questions. To use the nasal spray, remove the protective cap, keep your head upright and insert the tip into a nostril. Press down firmly on the pump to deliver the medication. Replace the protective cap. Use the other nostril the next day. Use this medication regularly in order to get the most benefit from it. Remember to use it at the same time each day. SIDE EFFECTS: Runny nose, nose bleeds, nasal irritation, dry nose with crusting, headache, dizziness, nausea, flushing of the face, or back pain may occur. If any of these effects persist or worsen, notify your doctor or pharmacist promptly. Remember that your doctor has prescribed this medication because he or she has judged that the benefit to you is greater than the risk of side effects. Many people using this medication do not have serious side effects. Tell your doctor immediately if this unlikely but serious side effect occurs: nasal sores. A very serious allergic reaction to this drug is unlikely, but seek immediate medical attention if it occurs. Symptoms of a serious allergic reaction may include: rash, itching/swelling (especially of the face/tongue/throat), severe dizziness, trouble breathing. This is not a complete list of possible side effects. If you notice other effects not listed above, contact your doctor or pharmacist. In the US - Call your doctor for medical advice about side effects. You may report side effects to FDA at 1-800-FDA-1088. In Canada - Call your doctor for medical advice about side effects. You may report side effects to Health Canada at 1-866-234-2345. PRECAUTIONS: Before taking calcitonin, tell your doctor or pharmacist if you are allergic to it; or if you have any other allergies. This product may contain inactive ingredients, which can cause allergic reactions or other problems. Talk to your pharmacist for more details. Before using this medication, tell your doctor or pharmacist your medical history. This medication is used mainly in women after menopause. Therefore, it is unlikely to be used during pregnancy or breast-feeding. Consult your doctor if you have any questions about this product. DRUG INTERACTIONS: The effects of some drugs can change if you take other drugs or herbal products at the same time. This can increase your risk for serious side effects or may cause your medications not to work correctly. These drug interactions are possible, but do not always occur. Your doctor or pharmacist can often prevent or manage interactions by changing how you use your medications or by close monitoring. To help your doctor and pharmacist give you the best care, be sure to tell your doctor and pharmacist about all the products you use (including prescription drugs, nonprescription drugs, and herbal products) before starting treatment with this product. While using this product, do not start, stop, or change the dosage of any other medicines you are using without your doctor's approval. Some products that may interact with this drug include: lithium. This document does not contain all possible drug interactions. Keep a list of all the products you use. Share this list with your doctor and pharmacist to lessen your risk for serious medication problems. NOTES: Do not share this medication with others. Lifestyle changes that help promote healthy bones include increasing weight-bearing exercise, stopping smoking, limiting alcohol, and eating well-balanced meals that contain adequate calcium and vitamin D. Since you may also need to take calcium and vitamin D supplements and make lifestyle changes, consult your doctor for specific advice. Laboratory and/or medical tests (e.g., bone density tests, nasal exams) should be performed periodically to monitor your progress or check for side effects. Consult your doctor for more details. STORAGE: Store unopened bottles in the refrigerator between 36-46 degrees F (2-8 degrees C). Do not freeze. For US products: Once the bottle is opened and the pump is primed, store at room temperature between 59-86 degrees F (15-30 degrees C) in an upright position away from light and moisture. Discard the unused portion after the number of days noted on the package. If you are unsure when to discard your brand, ask your pharmacist. For Canadian products: Once the bottle is opened and the pump is primed, store at room temperature below 77 degrees F (25 degrees C) in an upright position away from light and moisture. Discard the unused portion after 4 weeks. Do not flush medications down the toilet or pour them into a drain unless instructed to do so. Properly discard this product when it is expired or no longer needed. Consult your pharmacist or local waste disposal company for more details about how to safely discard your product.